When using VoIP, read and agree to the UT 911 Acknowledgement Statement (PDF). 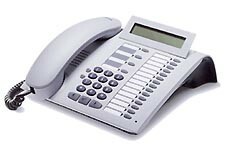 OptiPoint telephones are modular and support adapters for headsets or additional key modules. Please contact Telephone Services to inquire about these options. (Your call will be answered by the local Public Safety Answering Point). Knoxville campus numbers: dial only the last five digits (beginning with 4, 5, or 6 plus the four-digit extension number). Tullahoma campus numbers: dial only the last five digits (beginning with 3 plus the four-digit extension number). Knoxville local numbers: dial 8 + the seven-digit number. Toll Free numbers: dial 8 + 1 + toll free number. Dial 8 + 1 + area code + number. Dial 8 + 1 + the long distance number, listen for either a double beep tone or a steady continuous tone and enter the administrative authorization code. Dial 8 + 011 + country code + city code + number. Directory assistance: dial 8 + 411 (directory assistance fees will apply). To place a calling card call, dial 8 + 0 and follow menu. To place a collect call, third party or operator assisted call, dial 8 + 0 and follow menu. To obtain rates or billing methods, dial 8 + 0 to access an operator. For Customer Services, dial 8 + 1-800-593-1177. To access an alternative 0+ carrier, dial 8 + 101XXXX (the equal access number) + 0. To file a complaint with the Federal Communications Commission (FCC), visit the FCC web site. NOTE: Not all 101XXXX carriers provide 0+ access. If you have hearing, speech, or physical disabilities, notify Disability Services at 865-974-6087. Telephone Services will work with Disability Services on a case-by-case basis to determine when a customer is eligible for additional considerations. Should you experience annoyance calls, notify UT Police at 4-3114, or if calling from off-campus dial (865) 974-3114. Callback allows a user to request a position in a queue when calling a busy extension. Call Forwarding automatically reroutes incoming calls intended for a particular extension to another extension. Conference allows you to conference up to eight parties, including yourself on the same call. 1. Alternate between two calls. 2. Accept a call that has been parked. 3. Reconnect to a transferred call. Consultation Call lets you talk privately with a second party while the first party is waiting on soft hold. By using the CONNECT key you can alternate between two parties. Hold allows users to place a call on hold while they are making another call, conferring with another person, etc. Last Number Redial allows the user to save the number just dialed should the number called be busy or unanswered. Park allows a user to transfer calls to an extension, put it on hold there, and signal the user on the target extension that there is a call waiting. Phonemail notifies users of messages waiting on the Phonemail voice messaging system. The indicator is auditory (broken dial tone) and/or visual (solid red light), if provided. Pick Up allows users to answer, “pick-up” any other ringing phone. Both group pick-up and directed pick-up are available. Reminder program a timed reminder on your telephone to remind yourself on an important meeting or appointment. Repertory Dialing (R-) memory call provides one touch access to a programmed telephone number. Station Speed Dialing allows the user to program up to 30 frequently called internal or external numbers with dial pad buttons (00-29). Transfer allows users, after answering or originating a call, to direct that call to another phone or places a call on temporary hold and alerts the system that the user is preparing to use the keypad. Reference guides are available for all equipment maintained by Telephone Services. For problems with your phone service contact the OIT Helpdesk online or at 865-974-9900.